Reviewed as 24/96 download from hyperion-records.co.uk. Also available on CD and as mp3 and 16-bit downloads, all with pdf booklet. All but one of the works here, including the opening Magnificat, are receiving their only recording in the current catalogue. Scan the other currently available recordings and the Gramophone reviews database or our own search engines and you won’t find that there are or have been too many other recordings of Compère's music. Of these one of the most significant also came from the Orlando Consort, back in 1994, on Metronome METCD1002. That earlier recording was billed as Christmas Music, perhaps to encourage purchasers – though it contains the Christmas Mass Hodie nobis de virgine, that’s the only concrete link with the season. The final piece, O bone Jesu, was recorded long ago on a classic album from David Munrow and his Early Music Consort of London, The Art of the Netherlands. (Erato/Virgin 6284972, 2 CDs, budget-price). Though made in the comparative infancy of the rediscovery of the music of the period, that remains an essential recording and I wouldn’t wish to be without it or most of the other recordings from that group. 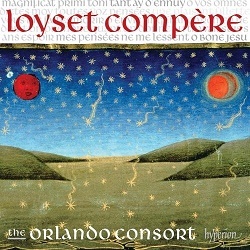 The Orlando Consort give the motet a little more time to breathe, thereby making it less immediate in appeal but more reflective and ending the programme in the quiet manner in which they began with the Magnificat. If you would like to sample this track complete, it’s there for the asking on the Hyperion web page or as part of their free download sampler for August 2015. The Hyperion recording is very good in 24-bit format. It won’t break the bank at £12.00 but I can’t imagine anyone being disappointed with the ‘ordinary’ 16-bit (£7.99) or the CD (£10.50). The booklet is well up to Hyperion’s high standards though the translation sometimes bowdlerises the original: cul in Une plaisante fillette, for example, I think refers to a more intimate part of the anatomy than the backside. I suspect, too, that there’s an indelicate reference in the refrain of this chanson, entre deuz huis, literally between two doors, as translated in the booklet. Huis is an archaic word for door, as in the expression still current, huis clos, in private, but there may be more to it here.